Remember eating those "fruit on the bottom" yogurts as a kid? Well now you can make one from scratch and without any preservatives. Enjoy this thick and smooth- textured yogurt made from a young Thai coconut. Warm up coconut water to about 88-90 F, using food thermometer. It should feel slightly warm to the touch. Place coconut meat, coconut water, and probiotic powder from the open capsules in a blender, and blend on high speed until the mixture becomes smooth. Transfer into a clean quart glass jar, or divide between 2 pint jars, close with lids loosely, set on plates on the kitchen counter, and leave for about 24 hours. The plates will help catch the yogurt if the culturing process becomes too intense. Once ready (it will start to taste a little sour), keep the yogurt in the refrigerator until ready to eat or use in the recipe right away. Mash blueberries in a bowl with a potato masher or fork, and place in the bottom of 2 serving glasses. 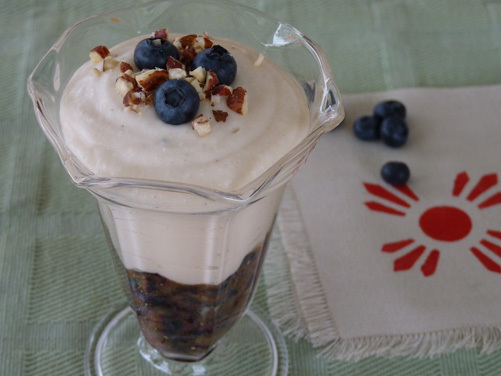 Mix honey into the yogurt with a spoon, and pour the mixture on top of the mashed blueberries in the serving glasses. Garnish with fresh blueberries and chopped nuts on top. Note: Preparation time is 15 minutes, plus time to make the yogurt.